Pattern: (name, author, source) Turing and the Apple, by Moi, available soon. Yarn: (name, fibre, weight, colour) Wooly Wonka Fibers Bamboo/Superwash Wool, 30% bamboo, 60% superwash wool, 10% nylon, sock weight, Macintosh colour. 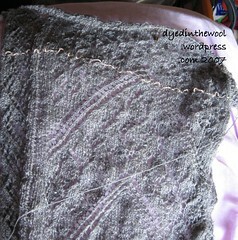 Construction: (toe/heel/ribbing/cast off or cast on) Top down, rib with garter stitch details, German Heel, grafted toe. Knitting style: (toe, foot/leg, heel, ribbing) Combination for rib and heel flap, English for rest of sock. Notes: So it didn’t win the Summer of Socks Design contest; I still love the design. Pattern available to buy here. Yes, my local, friendly library came through and I’m now approximately 0.001% finished (I’m up to Chapter 12)! Three of my favourite colours, all at the same time! I had to pick one to knit something in, so I chose two! Remember the swatch from way back when? Well, it’s all grown up! The pattern is from Elann and is called the “Sonata Print Lace-up Tank” – snappy name! In total contrast to Wren, there will be few or no modifications at all to this baby! What is very strange though, is I’m knitting the 38″ bust. And it fits. Weird! I haven’t been a 38″ bust since … the last time the Spice Girls were in fashion? The yarn is from 100% Pure Wool and is the merino worsted in combined colours. I can’t remember the exact colour name, but I think it was something like Chestnut or Marron (French for chestnut!) . Actually, I found that colourway on the site but if it was that, the colour is way off! 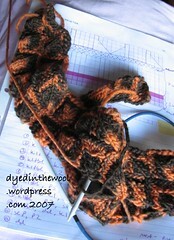 Still motoring along on sock 2, and thanks to my test knitters I’ve discovered some mistakes. I suppose that’s why I have testers! 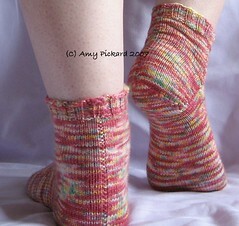 Sorry if you missed out this time around, I have plenty of other sock patterns bouncing around in my head. Not all will be publicized here during the making, but they will be eventually. And the deadlines will hopefully be longer! I forgot to mention in my last post that you need to have already signed up to the Summer of Socks to take part in the competition. Doh! Sorry. I’ll tell you more about the bombshell my mum dropped on me about not loving me any more not needed any more socks. I know.